The parallels with the Galloway case are striking and strong. In the Galloway affair we first raised the cry that Galloway should be driven out of the labour movement in January 1994. BBC cameras had recorded an “audience” which the fascistic Iraqi dictator had given to the Labour MP. The representative of the British left stood before the mass murderer of Iraqis and Kurds and praised him to his face for his “strength”, “courage”, ‘’indefatigability’’. We called on Galloway’s local Labour Party to throw him out as an MP. Politically, his exact motives did not matter. What mattered was the politics of a pseudo-left Labour MP championing, defending, and fawning on the head of a regime that was grinding the working class, the Kurds and others in the Iraqi state under the iron heel of a dictatorship as totalitarian as Hitler’s regime was. A Labour MP who did what Galloway was doing for the Iraq regime should not be allowed to remain part of the labour movement. Honest socialists and George Galloway belong to different species. He was, we are told, being “witch-hunted” by the bourgeois press, “victimised” because of his opposition to the recent war on Iraq. The duty of “solidarity” with Galloway against the bourgeois press, we were told, supersedes and overrides everything else. No it doesn’t! Solidarity with the Iraqi working class and with the Kurdish and others of its victims against the quasi-fascist Ba’th regime and against its paid and unpaid admirers in Britain — that was the first priority of socialists. If the first pillar of socialist wisdom is the understanding that “the main enemy is at home”, the second is an understanding that the bourgeois enemy at home is not the only enemy — and the third, the understanding that sometimes the enemy abroad is worse than the enemy at home. The last is the most difficult to grasp by people engaged in day-to-day conflict with that enemy. In 1981, they had sued John Bloxam and myself for libel when I compared them in Socialist Organiser to the Moonie sect and the Scientologists. I had reported — part of it based on my own adolescent experience of them — that they used systematic emotional, political and physical violence against vulnerable young people. The libel case was a pretty obvious attempt to “smash” SO and thus clear a competitor out of the way of the paper, Labour Herald, which they had just started in tandem with Ken Livingstone, Leader of the Greater London Council, and others. As part of that campaign I repeated again and again in SO that there was “circumstantial evidence” that they were in receipt of funds from one or more Arab governments. Repeatedly, I challenged them to sue me on that. They never did. If they had we would have been entitled under the legal “discovery” rules to examine their accounts... It was a tacit admission of guilt. Those who were using the libel laws against a labour movement paper now launched a political campaign in the labour movement against the BBC... and Socialist Organiser! It was a typically vigorous campaign. The Galloway-SWP business spurred me to go and look at a file of Newsline, where that heresy hunt is luridly recorded. It has much to teach socialists faced now  with the moral, political and intellectual collapse of the pseudo-left before political Islam, of which their attitude to Galloway is a putrid symptom. I will now expand on the bare bones of the story above. On 20 March 1983 BBC TV The Money Programme carried an item investigating the WRP’s financial links with Colonel Gaddafi’s Libyan government. They concluded that the WRP had got large sums of money from Libya, suggesting a figure of £1.5 million. They noted that Labour Herald (a Labour Party weekly nominally edited by Ken Livingstone and two others) and a paper published by George Galloway, the Dundee Standard, were printed by the WRP. The Money Programme suggested that money from Libya was channelled to the WRP by way of spurious printing contracts and, perhaps, that some of the benefits were being passed on to others in the same way. There were vague allusions to “the ethnic press” receiving Libyan money. In fact it was common knowledge that Labour Herald was subsidised by the WRP. Though its nominal editors were Ken Livingstone, Ted Knight and Matthew Warburton, it was actually edited by Steven Miller, a member of the WRP Central Committee. I had been invited to appear on the programme but, thinking it would cause more trouble in our own organisation than it was worth, declined. I wrote a 400-word review of the Money Programme in Socialist Organiser. Over the next two months Newsline would devote a page or two pages a day to denouncing that review and the Money Programme — two pages or more for every sentence in the article! I wrote: “There is need of a thorough investigation into the links of the ‘Workers’ Revolutionary Party’ (WRP) with various Arab governments. There is a lot of circumstantial evidence which suggests that the WRP receives sizeable sums of money from Libya, and possibly from other Arab governments. “The programme was both shallow and under-researched. It talked of the revolutionary left in general as possibly linked to Gaddafi by chains of gold. It talked about the left and ethnic press, but said nothing about the ethnic press. “The programme suggested that as much as £1.5 million may have been channelled to the WRP by the Libyan government by way of overpayment for ‘commercial work’. It did not investigate the financial side of WRP films like ‘The Palestinians’, which are popular in Arab countries. “There is still a need for a thorough investigation into the links of the WRP with Arab governments — a labour movement investigation”. The WRP had been invited by the makers of the Money Programme to comment but had declined. It made a pre-emptive strike on its front page of Saturday 19 March, the day before the programme went out. The headline: “We Expose BBC Witch-hunt”, and the strap-line: “Attack Due In Sunday’s Money Programme”. The “witch-hunt” was based on “slanders and lying allegations of so-called foreign gold”. As recent defences of George Galloway demonstrate, such statements virtually write themselves. “It follows in the ugly tradition of the Zinoviev letter”[a forged letter in the name of the leader of the Communist International, which brought down the 1924 British Labour government]. The Newsline had been “singled out because this paper cannot be bought politically and stands shoulder to shoulder with the working class and the oppressed masses of the world”. On the Monday after the programme went out, the whole front page was devoted to a “WRP Political Committee” statement on it, under the headline: “A Crude Frame-up”. The programme was “a lie from start to finish” and an insult to the WRP members who had to struggle to raise money for the organisation. Next day, all of pages two and three were devoted to the programme, and the first of what would be over two months of a page or half a page a day given over to testimonials appeared. Over the two months, in 50 issues of their daily paper, Newsline, they would publish statements, or resolutions of support for the WRP from one union conference, nine Trades Councils, 29 trade union branches or shop stewards’ committees, and 214 individuals. The individuals included many trade union convenors and branch secretaries, some well-known actors, one union general secretary, one MP, seven Labour councillors — and future government minister Patricia Hewitt, then general secretary of the National Council for Civil Liberties. The first statements were from Liverpool docker and long-time WRPer Larry Kavanagh; from Des Warren, who had served a 3 year jail sentence in the mid-1970s as one of the “Shrewsbury Three” building workers jailed for picketing in their 1972 strike; the Midlands regional secretary of the builders’ union UCATT; and an ASLEF branch chair. On 23 March a middle-page spread headlined the question: “Who was behind the Money Programme attack?” Answer: “The Zionists played a leading part in its preparation”. So did the Labour right wing. This was a theme that would get much stronger. Testimonials appeared from a Dundee branch secretary of the health workers’ union COHSE; the leader of the Labour Group on Lothian District Council; the deputy TGWU chief shop steward at Vauxhall Motors Ellesmere Port and vice-chair of Ellesmere Port Trades Council. Testimonials the next day, 24 March, included one from Jack Collins, secretary of the Kent miners; the chair of a London branch of NALGO; an executive member of Aberdeen Trades Council; and the secretary of the Labour Group on Lothian Regional Council. On the 25th: the deputy leader of Camden council and the treasurer of the GMB branch at Ford Dagenham testified for the WRP. The latter wrote proudly, as a WRP member: “I know that our paper and party need no foreign gold”. Many, testifying to their faith in the WRP leaders, would repeat this in the weeks ahead. It was one of the saddest things in the whole wretched business. The central note in the whole WRP campaign, the basis on which they solicited support outside their own ranks, was this: the BBC says it; what is said is against the WRP, which is part of the labour movement; therefore, it can’t be true. The prevalence of this idea, its power to shield the WRP, was one measure of the state of political morale in the sizeable section of the left that was drawn into the WRP’s campaign. The testimonials now had a regular logo: a photo — of the BBC cameraman and reporter outside the gate, vainly trying to get the WRP to answer the bell! — taken from inside the barbed-wire-on-high-walls fortress, a one-time factory, that was WRP headquarters. It would appear every day for nine weeks. On Thursday 24 March Socialist Organiser appeared with my review of the Money Programme. On Saturday 26th the Newsline responded with a middle-page spread under a headline: “Socialist Organiser joins the witch-hunt”. “Joins”? They had already, three days earlier, said that we, “the revisionists”, were “the first to put forward the lying slander about the WRP and ‘Libyan gold’.” Surely we were pioneer “witch-hunters”, if witch-hunt it was? The line they would take — and get a large number of labour movement bodies to take —was that once the BBC had said it, it was everybody’s duty to say it couldn’t be true, and thus to “defend the WRP” from “the state” and its “witch-hunt”. All thought about the substantive issue was now ruled out. Whether true or untrue, the charge was by definition a’’witch-hunt’’ and “a frame-up”. A WRP Political Committee statement dated 25 March responded to my review: “One revisionist group has publicly stated its full backing for the BBC state frame-up”. My “article provides resounding proof that this is a group which responds directly to the needs of the capitalist state... It serves the state’s interests and not the working class... Socialist Organiser has flagrantly betrayed [the] principle of working-class solidarity. It has crossed the floor, joined the class enemy, and is now adopting the role of prosecutor-in-chief on behalf of the Thatcher government and the Zionists”. 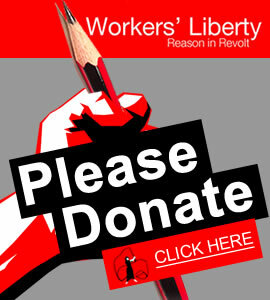 Entirely ignoring the articles I had published in Socialist Organiser over two years challenging them to sue me for saying they took Libyan money (they, who, through Vanessa Redgrave, were already suing us... for writing that they were “like the Moonies”), they went on: “Socialist Organiser has taken courage from the BBC to publish its article. It is not opposed to the witch-hunt. It supports everything that the Money Programme said. Its only disagreement with the BBC is that it did not go far enough”. The concept here of “witch-hunt” inverted the usual meaning. Any hostile outcry against the WRP was a “witch-hunt”. Facts became un-facts, and anyway were irrelevant. For what can one do with a “witch-hunt” but resist it and “defend” its victims? They had printed a photocopy of my article, so for the first time they had to answer Socialist Organiser’s long standing call for a labour movement inquiry. In my piece I counter-posed to the BBC inquiry the idea of a thorough labour movement inquiry. Socialist Organiser had been calling for that over the two years that Vanessa Redgrave’s libel case had been in train. That, said the WRP Political Committee, is “implicitly [to] call for the capitalist state to commence an inquiry into the WRP”. “Socialist Organiser’s call for a ‘labour movement inquiry’ into the finances of the WRP is a bogus cover for the capitalist state... It is designed to encourage further witch-hunts against the party and its daily paper in which the forces of the state will be able to call upon Socialist Organiser for justification of its repressive action”. “Will they sue the BBC?”, I had asked in the article they reproduced. They couldn’t, they said, because the BBC had been careful to “cover its legal tracks”. Now they reached the nuttily self-righteous punchline. “Socialist Organiser has come along and stabbed us in the back. Its article has put us under the direct threat of attack by the capitalist state” How, exactly? The state would listen to us, but not to the BBC? But the damage could be undone. They demanded that the article “must be withdrawn forthwith... We ask readers to take immediate steps to demand that the ‘Socialist Organiser’ article is unconditionally retracted by the paper’s editors. Please send individual letters as well as resolutions from trade union branches to Newsline for publication”. Blatant facts about the WRP became un-facts when the BBC reported them. Important issues raised by the BBC report became reasons for denying, on principle and in the name of working-class solidarity, the existence of any “issue” other than the BBC’s “attack” and Socialist Organiser’s comments. The “implications” of something determined whether it was true or not. Would this tissue of illogical nonsense influence what attitude people took? Would it? It already had. 28 March: the AGM of ACTT, the film and TV workers’ union, “repudiat[ed] all state-orchestrated campaigns of fabrications, smears and outright lies such as BBC TV’s Money Programme... deliberately intended to discredit organisations in the labour movement”. And if there was truth in the allegations, who then was “discrediting” the labour movement? Central to creating the psychology into which the WRP tapped — if the BBC says it, then it can’t be true — was the decades-old need for the pro-USSR left to deny and discount honest reports of the Stalinist societies and states. That belief could only be sustained by denial, lies and hysteria. By the 1980s, with the deepening of the “Second Cold War” triggered by Russia’s invasion of Afghanistan, this need to resist by denial and automatic discounting of unfriendly reports had again become very important, and was second nature to much of the left. Lesley Hammond, chief whip of the ruling Labour group on the Greater London Council, declared her faith in the WRP’s integrity. The then prominent actors, Ray Marsden, who played a fastidious upper-class detective in a popular TV series, and Polly Hemingway, were on the front page with a picture: “It is evident even from the programme that no truth existed in the allegations that the paper and [the printworks] were supported by Libyan money”. There was much “dialectical” gobbledegook in the article after that. Many statements were obviously indebted to some common “model resolution” which the WRP had put out. Only a minority of labour movement bodies would include Socialist Organiser in their strictures, but many did, as did individual statements. The demand that Socialist Organiser, and this writer by name, “retract”, would be shouted at us by a sizeable chunk of labour movement bodies and office-holders. Lambeth Trades Council passed an unanimous resolution denouncing the BBC and Socialist Organiser. “Organisations within the labour movement have a right to expect that when the class enemy attacks one section of the labour movement, the rest will close ranks in defence of the threatened organisation”. Precisely! The point, which Socialist Organiser had made again and again, was that the employees of Gaddafi, Saddam Hussein and other such scoundrels were not part of the labour movement, but stooges of its bloody class enemies. Dennis Barry, former AUEW convenor at an engineering works used Newsline to address us directly: “Socialist Organiser, you have got your priorities wrong. The workers of the world have enough battles without fighting each other”. Film producer Roy Battersby: “It is striking that... Socialist Organiser goes even further than the BBC in its provocation against the WRP”. SO’s article on the Money Programme had shown that it “is a group whose one role is to help the Thatcher state in trying to smash the proud political and technical independence of the working class and its vanguard party”. On 2 April: Ron Brown, Labour MP for Leith, found the programme “shocking”. For him, it was even “worse to learn that Sean Matgamna of the Socialist Organiser has jumped on this reactionary bandwagon”. From now on much of the comment was directed at me by name. Some of those making statements would repeat the demand that I “retract”. Brown was a political fool, but not, unlike most MPs, self-serving. He really believed in Gaddafi. The Labour MP was the only testamentary — apart from WRP Secretary Mike Banda — to express positive belief in Gaddafi. (He also believed in the civilising mission of the Russians in Afghanistan, on which subject I had debated him on his home ground, at a very big, very unruly, and very pro-Russian meeting). “We can disagree with one or other aspect of [Gaddafi’s] policy, but in general he has given encouragement and support to left-wing movements all over the world”. But not in Libya! Brown probably took it for granted that Gaddafi gave the WRP money. WRP members didn’t. Steve Drury, “a lecturer in Earth Sciences” and ASTMS and AUT member. “Every penny results from the respect in which the paper and the WRP are held by many thousands of politically conscious people”. Les Harrison, a TGWU shop steward: “I want you to know that I am absolutely incensed after reading about the article in Socialist Organiser. “The two [the Money Programme and Socialist Organiser] absolutely complement each other”. Ivor Demibo wrote that the Cumberland branch of UCATT “has condemned the BBC and Socialist Organiser”. “This branch recognises that an attack by the state and its media on any section of the labour movement threatens the whole working class and its organisations. We therefore condemn the article in Socialist Organiser... which joins in this despicable witch-hunt and call on the paper’s editors to unconditionally retract the article”. That sort of stuff was typical of resolutions where the WRP had strong direct influence. But there was a wider catchment: on 5 April a member of Plaid Cymru “defended the WRP”. Mike Gill, acting chair of a TGWU branch, wrote that: “this was an attempt by the British ruling class in collaboration with international Zionism to discredit a good honest workers’ paper”. On 6 April, Rich Lugg chair of the South East Airports committee of the TGWU: “As far as I am concerned a measure of Newsline’s correctness was the attack launched by the BBC on behalf of the Zionists and big business”. George Downing of NUPE wrote that: “Socialist Organiser should be condemned for their disgraceful breaking of the United Front”. In some of these statements you can see the word “Jewish” through the very thin cover given to it by “Zionist”. The WRP had by now announced a “meeting against the witch-hunt” at Conway Hall, in London, to denounce the BBC and Socialist Organiser. An ad for it occupied the top right corner of every Newsline front page. Tom Kempinksi honed his words: “No one buys us. No one, gentlemen, because principle cannot be bought. We are the proud, independent WRP, and we march under the banner of Karl Marx”. That sort of thing captured the underlying tragedy of it. Most WRP members were people who thought their leaders were honest communists, because they themselves were, or wanted to be. They rationalised from that, and really believed things like Kempinski’s credo here. A good credo, honoured only in the breach by the WRP. “Much of the denunciation of SO is extremely shrill and hysterical, lynch mob stuff. It is also extremely sad. People write expressing their faith in the charlatans who put out Newsline. “Letter after letter testifies to real sacrifices and devotion. People who couldn’t possibly know the secrets of the autocratic and conspiratorial leaders of the organisation write to testify from their own experience of struggling to raise money for the paper that it could have no financial link with Libya. Playwright Tom Kempinski writes in ringing tones, ‘We are not bought’ — rhetoric that rings pathetic and false in the circumstances. The WRP got knocked back sometimes, of course, as when the National Union of Teachers conference refused to debate the issue. “Anti Zionism” had been central to the campaign against the BBC and SO. From now on it would take off into the realms of political lunacy. On 9 April Newsline gave the whole centre page to “the witch-hunt”. The issue of the paper included the craziest of all the things they published at that time, an editorial asserting that there was a Zionist conspiracy stretching from Socialist Organiser, through Thatcher’s Cabinet, all the way to Reagan’s White House. Across the page from that editorial, Ken Livingstone, Leader of the Greater London Council and joint nominal editor of Labour Herald, gave his tribute to his benefactor the WRP. This was the once-Red Ken in crank mode. “The Money Programme attack on Newsline, Labour Herald, and [George Galloway’s] Dundee Standard was gutter journalism... smear techniques used... against the labour movement press”. “It is important when these kinds of attacks are made that the labour movement stands united and fights back as one”. It is improbable that Livingstone would believe the WRP denials on “Libyan gold”. He certainly knew that his Labour Herald benefited from the tiny WRP’s mysterious wealth. For SO too this editorial marked a new stage in the conflict. The abscess was open. Only those who didn’t want to see, or smell, could ignore Newsline’s lurch into Nazi-like “Protocols of the Elders of Zion” raving. I responded in SO (14 April) with an article, “Gerry Healy Discovers the World Jewish Conspiracy” [see page 8 of this pull-out] and a reprint of the Newsline editorial. Livingstone wouldn’t have seen the editorial before he made the comments that seemed to endorse it and give it credibility. He ignored Socialist Organiser’s request that he say where he stood on it, thus deliberately maintaining his solidarity with the mad editorial and those who published it. Livingstone and other “left Labour” people played an irreplaceable role in the WRP’s campaign. They helped give it a credibility it would not otherwise have had, way outside the influence its own comparatively small numbers gave it. A lot of people in the labour movement knew the WRP, and had long known that what Socialist Organiser said about the Libyan gold was probably true. Yet the instinct to back even the WRP “against the state and the BBC” rallied people to them. The backing of the Livingstones helped discredit what Socialist Organiser said and helped the WRP get off the hook by turning the issue into a small labour movement referendum for or against “Thatcher’s state and its media”. Livingstone was at this time trying to displace Reg Freeson as Labour candidate in Brent East. (He would win the seat in 1987). Freeson was Jewish. Denunciations of “the Zionist Reg Freeson” occupied much space in Newsline. Re-reading that stuff now what strikes me is that the sense of these denunciations of the Labour right winger Freeson — SO supported Livingstone against him — would better be conveyed by “the Jew Freeson”. Almost all of SO supporters had the same formal position on the Arab-Jewish conflict as Livingstone, “a secular democratic state” (a tiny minority only of us were for a two state solution, and a much bigger minority was rabidly “anti-Zionist”, Alan Thornett and his supporters). SO did not comment on this aspect of the anti-Freeson campaign. This is a good illustration of the mental world of a serious old Trotskyist militant who had come that far with Healy. I remembered McLarty 22 years earlier as the only person at an SLL [proto-WRP] annual conference to — vainly — try to get a real discussion about a contentious issue (Castro’s Cuba). Richard Price, who is still politically alive, typically missed the point with an analogy between SO’s call for a labour movement inquiry into the WRP and the evasive call made in the 1930s by Fenner Brockway, secretary of the Independent Labour Party, for an inquiry into the Trotskyists at the time of the Moscow Trials. This call for a labour movement inquiry had in fact first been made two years earlier, when they sued us. Prominent labour movement people who had then put their name to it included… Ken Livingstone (before he allied with the WRP)! The “Newsline sellers” of Belfast made a collective statement: “Newsline readers, Republicans and activists will be politically incensed by the article in Socialist Organiser which openly supports the BBC slander and especially by the hate filled remarks of a revisionist called Matgamna who tries to pour scorn on the security arrangements” of the WRP. On 14 April John Biggs-Davidson, Tory, and David Ennals, Labour, raised the BBC allegations in Parliament. It was new wind in the WRP campaign’s sails. Dave Douglass, a miner and one-time Posadist, wrote an open letter denouncing Socialist Organiser. [The Posadists were a strange sect that believed in flying saucers and advocated that Russia launch the Third world war in order to hasten the coming of world socialism]. Ex-BBC Controller Stuart Hood, who — it seems — had long held private and platonic “Trotskyist” opinions, and, I guess, must at some time have been a member of the Healy organisation, waded in for the WRP. So did Gerry Caughey, secretary of St Helens Labour Party. Dave Thompson, AUEW convenor at Vauxhall Motors Ellesmere Port, threw in his weight against “the witch-hunt”, together with other trade union office-holders there. As well as the daily page of testimonials, there was additional coverage. On 15 April a middle-page spread: “Socialist Organiser has capitulated to the Tory class enemy by supporting the 20 March programme on BBC2. That is why they are now in the company of such ultra-Tory MPs as John Biggs-Davidson”. 16 April: Ted Knight Labour leader of Lambeth Council and a Healyite for thirty years, declared: “The article in Socialist Organiser endorsing the witch-hunt and the Money Programme is outrageous”. For “Red Ted” too, it was “the Zionists”. “The Zionists have not forgiven the Labour Party and TUC resolutions last year which recognised the PLO”. The eminent thespian, Sir Timothy West, wrote a long statement of support against the BBC. His was the sole contribution that, gently, distanced itself from the WRP’s pro-Gaddafi politics. He did not attack Socialist Organiser. By now the WRP was holding “broad” labour movement meetings on the issue all over the country. Denunciation of Socialist Organiser was a big feature of all these meetings, to go by Newsline’s reports and those of SO supporters who attended them. In Liverpool, Michael Banda, National Secretary of the WRP, spoke beside Bobby Owens, chair of District 6 of the TGWU, Bill Kerrigan, chair of the National Union of Seamen North West Panel, and a Labour councillor. On 20 April four Socialist Organiser people — Mick O’Sullivan, Pete Firmin, Jane Ashworth and I — turned up at the WRP’s central “anti-witch-hunt” meeting at Conway Hall, in London, to give them an argument. They wouldn’t let us in! Of the billed speakers only Peter Tatchell, then a Labour Party PPC, showed any concern at our exclusion from a meeting that would be largely given over to denouncing us; but he too took his place on the platform. “Red Ken” and “Red Ted” and others joined WRP General Secretary Mike Banda on the platform to listen to him praise his paymaster Colonel Gaddafi, and Libya. Gaddafi, he said “has become the symbol of the struggle for national liberation… .” Libya was, he said, like a watermelon: Islamic green on the outside, but red inside! We gave out a leaflet reiterating our stance to whoever would take one. A photograph of us doing that would henceforth be a feature of the press campaign against us. Michael Banda said, “We will expose these people for the charlatans and slanderers that they are”. The Conway Hall meeting — they claimed it was 700 strong — including the platform speakers, “unanimously” passed a three point resolution. This formula of “retraction” in fact had nothing to do with the alleged BBC “witch hunt” and everything to do with the campaign to discredit SO. It spilled over into the public domain from the WRP’s internal practice, in which a member showing any independence could be confronted, humiliated and degraded at a moment’s notice with arbitrary demands from the leadership to “retract” or “apologise” to the meeting” for something or other (like being five minutes late). The meeting “unanimously” “denounced” the BBC Money Programme “as a state-organised and Zionist influenced witch-hunt”. The audience at Conway Hall and the platform speakers (they included the theatre producer Thelma Holt) who voted for this stuff present in themselves a terrible picture of the state of at least part of the left then. On 22 April Nupe Branch Secretary Frances Fallon’s testimony was headlined “They try to silence the voice of the masses.” If you thought about what Gaddafi and Khomeini — the WRP supported the Iranian Islamic regime — and Saddam Hussein did to the “masses” with the WRP’s vocal support, you saw the tragic political confusion of those who sincerely “defended” the WRP in such terms. My response (SO 14 April 1983) to the blatant antisemitism of the editorial about SO’s “Zionist” conspiracy with members of Reagan’s government and Margaret Thatcher’s Cabinet was petrol on the fire! Charlie Pottins, long-time WRPer, one-time Zionist, and later member of the Jewish Socialist Group, wrote an indignant rebuttal of this article over three pages of Newsline, which ignored all the important points. This would be the centre-piece of a pamphlet which they now produced. Brent Council’s Joint Staffs Committee, representing 12,000 workers: “We condemn SO, who have abandoned all pretence of socialist principle and sided with the capitalist media and state in calling for an investigation into the WRP.” They too demand that we “retract”. This is a quasi Stalinist world, where the question of what is true and not true does not exist in its own right. There is only “our side” — as if an appeal to the elementary principle of working class solidarity can answer for an investigation of such issues: as if there is such a thing as “class truth”, “class facts”. Eddie Roberts, TGWU organiser and former convenor of Fords Halewood, found it “inconceivable” that any socialist paper, on the basis of this BBC programme [!] can support the attack on Newsline. 26 April headline: “Libyan Magazine slams frame up!” The London segment of the Libyan People’s Bureau! “The Zionists [i.e., Jews] are allowed to work against Britain’s political and economic interests free from the attention of the press”. These were the people who employed the WRP — it came out in 1985 when the WRP fell apart — to provide reports on Arab political dissidents in Britain and on prominent British Jews. The politics of this statement should have given socialists pause for reflection. Now a new theme: SO is out to “get” Ken Livingstone. There is an indignant half page about SO supporters in Brent, where Ken Livingstone was publicly asked by SO supporters to account for his part in the WRP’s Conway Hall meeting. Glasgow District Labour Party — an ex-WRP turned reformist, Chic McCafferty is in the chair — condemned SO in the pages of Newsline. The Joint Shop Stewards Committee at London Hospital condemned “fabrications and lies and innuendos” by the BBC and “calls for SO to withdraw their backing from this attack”. The Newsline articles now become incitement to violence. On the 4 May, Newsline editor Alec Mitchell, the ex-Murdoch journalist, responded to my review of their pamphlet on the affair under the headline “More ranting lies from Mr Matgamna”. To add point to this lynch-mob stuff they reprinted the picture of me outside their 18 April Conway Hall meeting. This hysterical self-righteousness in people who had recently printed the editorial about the world-Zionist conspiracy, and who functioned to filter Arab anti-Semitism into the British labour movement, probably indicated their own tensions and confusions. As SO had said it: their past must have made some of them ashamed of what they had become. An editorial on 5 May titled “Jewish Chronicle — Matgamna ally” dealt with a Jewish Chronicle article discussing Libyan influence in Britain: “All the slanders and lies were served up in the Money Programme. They have since been adapted and expanded by pro-Zionist [i.e., Jewish — SM] MP Reg Freeson and Mr Sean Matgamna’s Socialist Organiser group... when Newsline raised the Zionist connection in the witch-hunt, Mr Matgamna made the disgusting accusation that the WRP and its leadership were antisemitic and ‘potentially pogromists’ [in fact I’d said that the Jewish Chronicle’s interest in the WRP was hardly surprising: the WRP must seem to them to be ‘potential pogromists’]. “This is the basest piece of slander ever [!] levelled [!] against the Trotskyist [!] movement [!] since the Stalinists in the 1930s accused it of being ‘agents of Hitler’. [SO] stands with the state media arm, the BBC, and with the Jewish Chronicle.” The Jewish community paper is the equivalent of the “state media arm”? The BBC has no autonomy and is only a “state arm” for propaganda? Socialist Organiser was then divided between relatively recent former WRPers on one side and the rest of us. In fact, the Thornett group considered the two states position, still very much a minority view in Socialist Organiser, to be “Zionist”. But the WRP attempts to invigorate this SO minority failed entirely. All they got was an indecisive attempt by one of the minority leaders, Tony Richardson, to publish a letter in SO rejecting the idea that the WRP was antisemitic (“the idea is laughable”, etc.). There are now many public meetings against the BBC and SO. In Birmingham, Liverpool, Manchester, etc., etc. In Glasgow, with Ron Brown MP; SO features in many resolutions now. Evidently the writer did feel strongly about antisemitism. There is no reason to doubt his sincere hatred of antisemitism, which he will have bracketed in his head with Nazi persecution of the Jews, with Tsarist Russian pogroms, the anti-Jewish campaign by the Mosley fascists in the 1930s, etc., etc. He evidently can’t even entertain the idea that the writers of the recent editorial on the “world Jewish conspiracy” are now a quirky variant of what he hates. He rationalises from what he wants them to be. Such people couldn’t let themselves see antisemitism where it was rampant. When they themselves were wading waist deep in it. The term “Zionism” here served its camouflage purposes well with people who didn’t want to understand. Now another new turn: they devote a lot of space to denouncing SO for its alleged attitude to Ken Livingstone, seeking the Labour nomination for Brent East. “Mr Matgamna of Socialist Organiser has begun a ‘stop Livingstone’ intrigue — he is so pathologically opposed to the WRP that he will try to destroy anyone in the labour and trade union movement who appears on our platform. Recounting when Livingstone gave Newsline a principled statement of opposition to the Money Programme [the statement across a page from the crazy world-Zionist conspiracy editorial — SM] Matgamna went into a rage. Matgamna accused the WRP of being ‘antisemitic’ and ‘potential pogromists’. These hateful calumnies were extended to Livingstone with the flourish of a Vyshinsky [prosecutor in the Moscow Show Trials of the 1930s] or a Senator McCarthy. A whole page is given to the still popular actor David Calder-then a cop in a popular TV show — denouncing the BBC: “Newsline not only earns the hatred of the ruling class and with them of those who declare themselves to be of the left but, in their heart of hearts, believe the working class to be defeated. “Of all the groups the Socialist Organiser now stands exposed as the most insidious and treacherous of them all stooping to a racist attitude on the Arab struggle [!] accusing the WRP of being anti-Jewish, places them outside the workers’ movement and exposes them as an instrument of the state in its desperate black propaganda campaign. It is only the Newsline and the WRP that fights for the independence of the working class”! On the 16 May one hundred people were reported to have attended the Liverpool meeting. Aberdeen trades council passed a resolution on the lines quoted. The Newsline printed the speech, evidently written up by its author, that had introduced it. This gives us a rare account of a typical WRP speech on the subject then, that is, of how the Newsline’s “anti-Zionism” translated into the work of the WRP in the unions. The speech ranted, carrying the words in the Newsline editorial on the world Zionist conspiracy, about “Mr Stuart Young, a well-known Zionist” [that is, Jew] “being chair of the world’s largest radio and TV company” the BBC: “It should not go unrecorded, thought it went quickly through the news.” This is the sort of thing into which the Newsline’s rantings had translated “on the ground” — agitation against a Jew being appointed governor of the BBC. On the 25 May, in another editorial: “Freeson’s Bagman” [guess who]. This is an attack on SO because its supporters campaigned in Brent East in the upcoming general election for the re-election of the official Labour candidate, Reg Freeson! “A Trotskyist-baiting Zionist” [read Jew]. But the General Election campaign is now starting and the WRP’s campaign dies down. Over nine weeks and 54 issues, there have been more than 50 pages of testimonies and much else besides. The statistics of it can’t tell the number of individuals and trade union branches and trades councils who voted or nodded through the “down with the BBC and SO” resolution. In fact the campaign achieved none of its objectives: we gave as good as we got, and continued to comment as we thought fit. The experience educated and toughened SO supporters. Vindication of the sort that was ours when the WRP imploded two and a half years later — one of the casualties was Labour Herald, Livingstone’s’ paper which collapsed when the WRP did — is rare in politics. None of us who knew the WRP were unduly alarmed by the lynch mob atmosphere they tried to whip up. They had a deserved reputation for small-scale thuggery but they talked a better fight than they fought. They made a few clumsy gestures-a couple of flats of SO people were broken into and nothing taken although political papers were rummaged through. They sent a couple of “agents” into SO. They were too obvious to get away with anything: the WRP could train its people to rant in trade union branches about the “Zionist” chair of the BBC, but subtlety it couldn’t teach them. An unknown quantity was what their alliance with Libyan state personnel and others meant for their “lynch SO and Sean Matgamna” campaign. Someone in the Libyan Embassy about then shot dead a police woman Yvonne Fletcher. In fact nothing happened. One of the most disappointing things about the affair was that when, in October 1985, the truth about the WRP came gushing out from its warring factions, not one of those who had denounced SO, neither an individual nor any of the labour movement bodies which had passed resolutions denouncing us and demanding that we “retract”, felt they had anything to apologise for. Not a single one. The experience outlined above tells us nothing about current disputes except that it is always a good policy in such affairs to follow the advice which Karl Marx, speaking in the words of the 13th-century Florentine, Dante, put at the beginning of Volume 1 of Capital. “Go your way and let the people talk.” Decide what you think and stick to it until someone gives you reasonable grounds for changing your mind. • Footnote: It is phrased like that because in fact the WRP had not raised that cry. Some members of the Thornett faction in the Socialist Organiser Alliance had. Labour Herald was a Labour left paper nominally edited by Ken Livingstone and Ted Knight but actually run by the WRP. 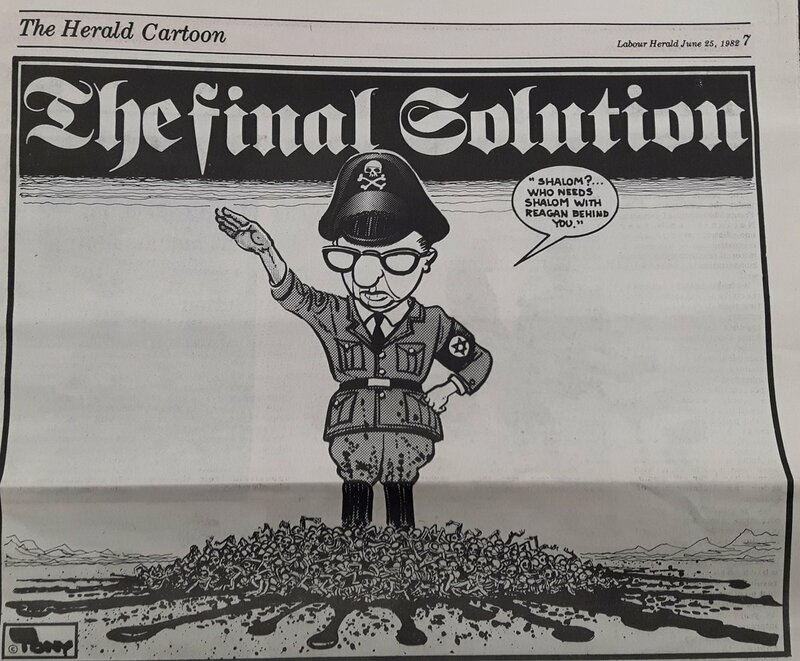 Though deliberately blander in tone than the WRP's own Newsline, it published antisemitic images like the cartoon above conflating Israeli Prime Minister Menachem Begin with a Nazi.